The phasing out of cheques by 2018 will leave millions of pensioners stressed about how to manage their financial affairs, a pensioner group has warned. The National Pensioners Convention (NPC) wants a paper alternative to cheques to help pensioners who cannot use the internet to transfer money. Its call comes as a BBC survey reveals more than three-quarters of pensioners are against the phasing out of cheques. The NPC wants older people to be guaranteed a paper-based alternative. "If cheques are taken away from older people it will create an enormous stressful situation for them, because their bills are paid on time, with a cheque, in an envelope and put in the post," says NAC general secretary Dot Gibson. "We have told the authorities that what is going to be required is a paper trail to replace the cheques." The Wandsworth Older People's Forum in south London is one of the many groups of pensioners worried about the demise of the personal cheque. "A lot of people who are housebound use cheques daily, and a lot of people who have no computer and therefore can't get onto the internet or do internet banking would be lost without it," said its chairman Tony Tuck. Many pensioners say cheques still play a big part in their everyday lives. "I use cheques for paying charities and donations like that," said the forum's honorary secretary Lilias Gillies. "I use cheques to pay to the church and giving money to friends, if friends buy something for me I pass money over to them for that." Personal cheque transactions peaked at 2.4 billion in 1990, but have now dropped to just 663 million. Many experts believe internet banking or mobile phones, already used to transfer money in some other countries, could be used more here. But charities argue that many older people are not comfortable using the technology. "I don't because I am not set up for internet banking at all, I'm sorry to say," says 93-year-old Cyril Marshall, a founder member of the Wandsworth Older People's Forum. "I've never thought of it." 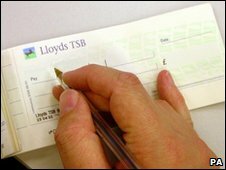 The Payments Council says it's considering viable alternatives to cheques. "We need to look at how we can reduce cheques, we need to look at how we can reduce volumes," said spokeswoman Sandra Quinn. "But in the last count we are going to be looking at alternatives that suit those people that need something ,and if that involves a paper voucher that may be what's required. The consultation process is set to continue, but the plan is to abolish the system that processes cheques by October 31st 2018. Can you live for a day without cash?